Sea bass fillet fried in brown butter, lemon and garlic, with pan-fried potatoes, peas and a little salad. I think I’ve mentioned somewhere on this site that one of my favourite ways of cooking sea bass is fried in butter with lemon and garlic. Actually … I think that’s the only way I have ever cooked it. Anyway it’s very very simple and very very tasty. I’m not tagging this convenience-health-food though – because any meat or fish that I fry smells up the kitchen and so it’s not convenient. At least not for me. Why brown butter? Because when I was just about to add the fish to the pan I noticed one of the fillets still had some scales on its skin. So I was just scraping them off … and the butter turned brown. It tastes great. Just a little bit nuttier than the non-brown version. So this cooks very quickly. It’s very simple, very tasty and very quick to make. No, I’m still not calling it convenient. Also, I do add a lot of butter to the pan. But fish is always a healthy option, isn’t it? So I’m going to tag it heart-healthy. It’s fish. I’m not totally sure because the fish wasn’t labelled that way. But using an online recipe analyser it calculated nearly 30g of protein, so I’m guessing it offers about 25g. Apart from the protein is Sea Bass good for you? Yes. It’s a good source of omega 3 fatty acids, B6 and selenium. Here is some more information on that. There is one small problem with sea bass though. It is one of the types of fish which is likely to contain higher levels of mercury. This means it should be avoided by pregnant women and children – and I think it’s supposed to be just a once-a-month treat for the rest of us. Tastes like one to me. Sea bass fillets, baby potatoes. lemon, garlic, parsley, butter, olive oil, salt and pepper. Put the baby potatoes in a microwavable dish. that has a lid, with a couple of spoons of water. Cook for 1 minute per potato. Drain and let cool for 2 - 3 minutes. Slice the potatoes. Cook the peas in the microwave - about 2 - 3 minutes. Heat some oil with some salt and pepper in a frying pan. Add in the slice potato. Let them cook until crispy - it will take just a couple of minutes. Remove from the pan on to plate while you fry the fish. Add half the butter to the pan. When it has melted and browned, add in the fish skin side down. Spoon some of the browned butter over the fish. Let cook for a couple of minutes then add in the garlic, the remaining butter and squeeze half a lemon over the pan. Again spoon some of the sauce over the fish. Let cook for another two minutes.Turn the fish over just for a quick minute before serving skin side down on plates. Spoon some of the butter over the fish. Serve with half the potato, peas, salad leaves and a lemon wedge. First fry the potato, then the fish. 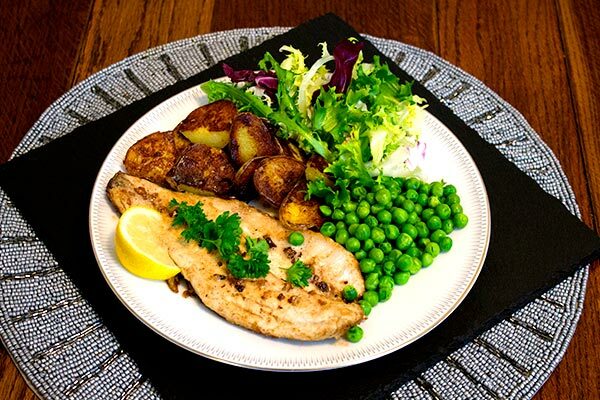 sea bass fillet fried in brown butter, garlic and lemon, with pan-fried potato, peas and salad.